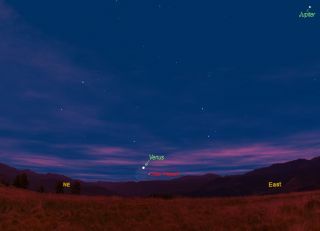 This sky map shows the moon and planet Venus will appear together on June 30, 2011 as viewed from mid-northern latitudes. Jupiter's position is also shown. The planet Venus has been hanging around in the dawn sky all month, rising less than an hour before sunup and staying at nearly the same altitude above the dawn horizon all month. The planet will be leaving the morning sky soon, but not before a curtain call with the moon. You can still see Venus very low in the sky, just above the east-northeast horizon about 30 minutes before sunrise, and on Thursday (June 30) it will appear near the crescent moon. But over the next few weeks the planet will shift even lower each morning. Astronomers use a reverse magnitude scale to define the brightness of celestial objects — the lower the number, the brighter the object. A negative magnitude denotes a brilliant object. Venus is currently shining at a scintillating magnitude of -3.8, an amazingly bright sight. But time is running out to see Venus for summer skywatchers in the Northern Hemisphere as the planet dips lower in the sky. The sky map available here shows where to look to spot Venus and the moon together on Thursday. By July 10, observers at or near the 40-degree north latitude line on the map will see Venus sit just a scant 3 degrees above the east-northeastern horizon 30 minutes before sunrise. Your clenched fist held at arm’s length measures roughly 10 degrees, so Venus will appear only about "one-third of a fist up" above the horizon. Venus will continue to rise closer to sunrise, and will ultimately become lost from view in the bright sky in the mornings that follow. So for all intents and purposes Venus will then take the rest of the summer off. In fact, after Venus disappears from view in July, the next time you likely will see it, will come either at the very end of September or early in October. But when it returns, Venus will be an evening sky object, since it will pass superior conjunction — when it is behind the sun as seen from Earth — on Aug. 16. Venus' first evening appearance in August will be very low near the western horizon immediately after sunset. Before it vanishes out of sight for the next few months, Venus will have one final morning rendezvous with a hairline crescent moon early on Thursday morning. But because of the low appearance of the planet and moon in the sky, as well as the brightness of the morning twilight sky, there may be a certain degree of difficulty for skywatchers trying to see them. Unquestionably, you will enhance your viewing chances by using binoculars and having access to a clear and unobstructed horizon. You should also hope that your local skies are clear with little or no ground haze. Early Thursday morning, the exceedingly narrow waning crescent moon will appear about 1.5 degrees below and to the left of Venus. The moon will be only about 1 percent illuminated and just about one day from new phase. While Venus might be visible to the naked eye, the moon may not be immediately visible. So carefully scan the sky below Venus with binoculars using the brilliant planet as your guide. To be sure, this will be a very challenging observation. Good Luck! If you snap a photo of Venus and the moon, and would like to share it with SPACE.com for a future story or gallery, contact managing editor Tariq Malik at tmalik@space.com.